Known primarily as the last person to be jailed for blasphemy in America, Kneeland was a consistent and outspoken advocate for free speech. Kneeland was born on April 7, 1774 to Timothy and Marie (Stone) Kneeland in Gardner, Massachusetts. He received little formal education, but learned Latin, Greek and Hebrew. He became a school teacher, and moved to Dummerston, Vermont to head a school. He married Waitstell Ormsbee in 1797. His ministerial career began when a nearby Baptist society in Putney, Vermont invited him to be their regular preacher. Sometime after starting this ministry, Kneeland had read a book by the Universalist Elhanan Winchester, and was converted to Universalism. He received a Universalist license to preach, and was ordained in Langdon, New Hampshire in 1805. He served there for six years, and became well known through the circulation of pamphlets. He also served in the New Hampshire legislature for two years. But these years were also marked by sadness, as his wife and a child died. At the meeting of the Universalist General Convention in Newtown, Connecticut in 1807, Kneeland was made clerk. 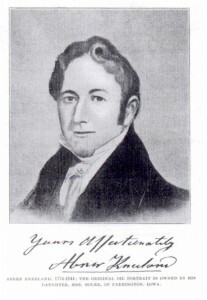 He also became part of a hymnbook committee with Hosea Ballou. Kneeland was next called to serve in Charlestown, Massachusetts, and he was installed there in 1811. The society had considerable problems with debt, and had trouble paying Kneeland’s salary. To supplement his income he joined with his new wife in running a store in Salem, Massachusetts, and decided in 1814 that he could not devote enough time to parish work. Kneeland was beginning to have some theological doubts. He carried on a correspondence with Hosea Ballou where Kneeland revealed his belief that the Scriptures came out of human experience rather than divine revelation, and this was published in 1816. He was soon back in the pulpit though, and took a parish in Whitestown, New York in 1817. This was followed after a year by a ministry at the Lombard Street Universalist Church in Philadelphia. This was his most successful pastorate, although some members left after he declared his belief in no period of punishment after death. The growth of Lombard Street allowed another church to be organized in 1820 (Second Universalist), and Kneeland served both with the help of an associate. He left after seven years to serve the Prince Street Universalist Church in New York City. This congregation followed the more conservative theology of John Murray, and found Kneeland’s radical thoughts too disarming. He soon resigned. He stayed in New York to edit a new paper, the Olive Branch, which was produced by the New York Universalist Book Society. Kneeland used the paper to criticize the churches, but he had enough supporters to back him in a new ministry at the newly formed Second Universalist Society. Unfortunately, Kneeland had Frances Wright, an advocate of communitarian experiments, speak in his pulpit. The congregation resented her presence and Kneeland’s advocacy of a radical economic restructuring of society, and they dismissed him. The next year, Kneeland attended a meeting of Universalists in Hartford, and presented his theological views. He asked that his Universalist fellowship be continued, but this was refused, and he was withdrawn from the list of acceptable ministers. For a time he lectured before a group called the Moral Philanthropists. In 1831 he moved to Boston to edit a new paper, the Boston Investigator. He also became the leader of the First Society of Free Inquirers. Kneeland became a popular lecturer, and he traveled back to Philadelphia and New York. His editorship of the paper became especially controversial. He supported a large number of radical causes. He spoke in favor of labor reform, including a ten hour work day. He spoke for women’s rights, too, advocating the practice of birth control. He was the publisher for the first published advice on birth control in America. This was Charles Knowlton’s pamphlet, The Fruits of Philosophy: The Private Companion of Young Married People (1832), a controversial work which landed Knowlton in jail. What especially caused controversy was Kneeland’s insistence on free thought and the right of conscience. His attacks on Christian doctrine were handed over to the Grand Jury, and he was indicted for blasphemy. In his paper he wrote that he thought that people’s concept of God was a figment of their imagination, that the story of Jesus was a fable, that miracles did not happen, and that there is no eternal life. After many delays and several years of new trials, Kneeland was finally convicted and sent to jail for sixty days. A petition campaign spearheaded by William Ellery Channing to secure his release was refused. From his prison cell, Kneeland continued to call for liberty. Once he was released, he decided to go West. He settled in a new community he called Salubria where neighbors were gathered together united in respect for freedom of opinion. He died on September 25, 1844.